A durable waterbased alternative to traditional solvent based preservatives and creosote substitute. The Clubman comes with double doors as standard giving you wide access to your building and a higher roof height than our premium sheds. Bright and spacious: At the height of 5'8" the half glazed-door provides a stable and stylish entrance, and with the opening windows, it gives the log cabin with plenty of sunlight during the day. The Clubman has been designed as an entry level log cabin with all of the options you require in one package. 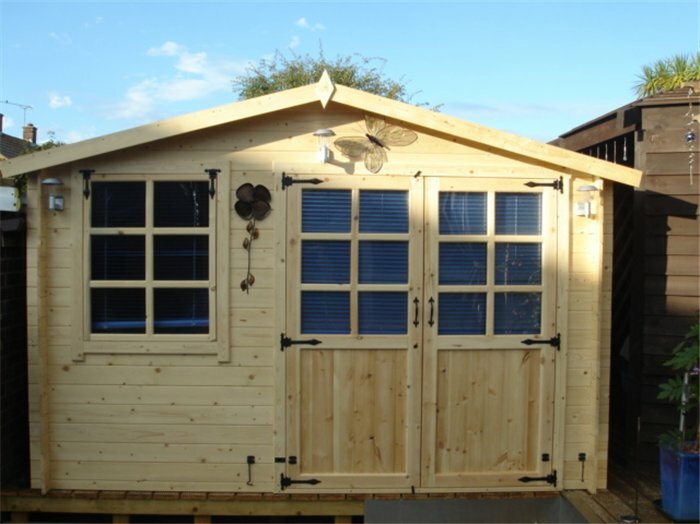 The log cabin can be assembled in several different configurations to place the doors and windows in the optimal position for your garden. 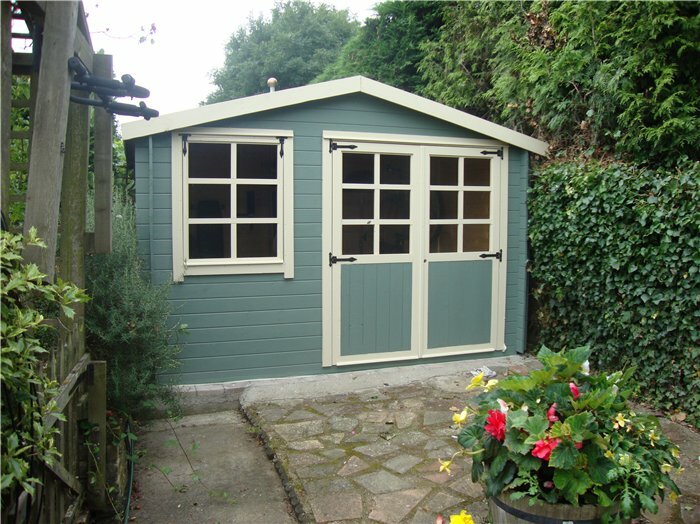 The Georgian half glazed double doors give your building added style and wide access, providing space for adding large furniture or storing large items. 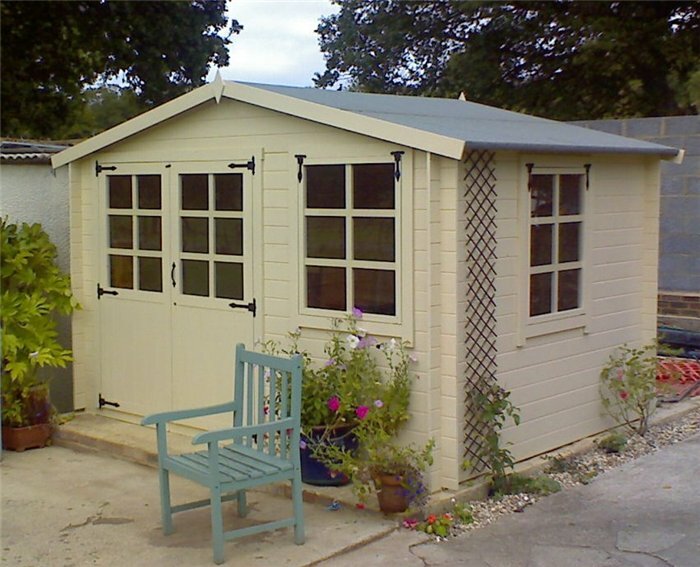 The single glazing is designed for seasonal use, perfect for a typical summerhouse. The floor and roof are included in the price, giving you a tremendous seasonal living space that is simple and affordable. 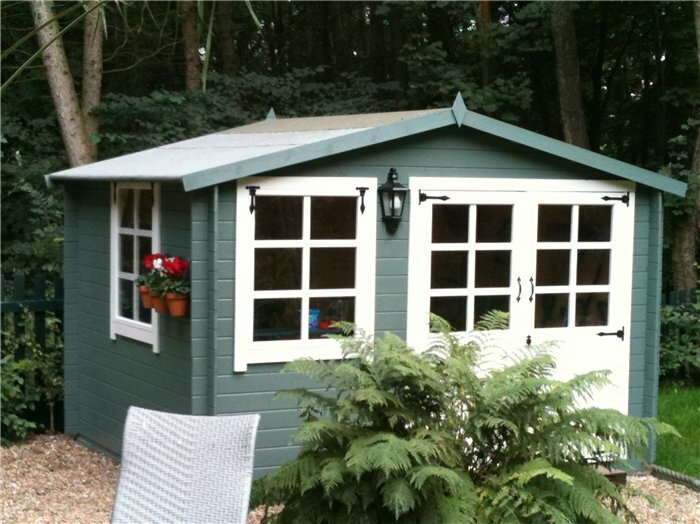 We also provide you with a mineral felt roof covering for added weather protection. You may even be tempted by our range of treatments and premium paints if you are looking to add a personal touch to your building. The Clubman uses interlocking timbers, a traditional building method that gives additional strength to all of the boards. This is a far superior technique, firmly fixing the timbers together and using their combined weight to give extra rigidity to the structure. The timber used for the building walls is 19mm tongue and groove, an entry-level log cabin cladding that makes the Clubman an affordable option. But if you are looking for an upgrade, the BillyOh Clubman is available in 28mm thickness too. 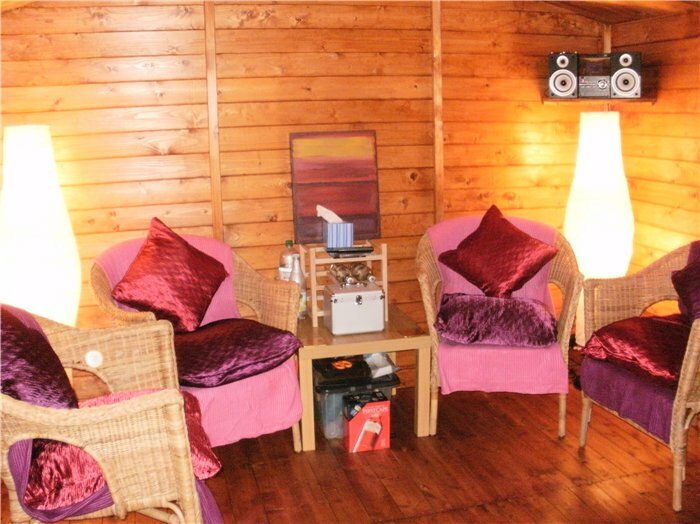 With walls that are much thicker than the average garden shed, it has a strong and rigid construction so you can look forward to enjoying your log cabin for many years to come. The Clubman features an entirely crafted pair of half styrene glazed doors, hung using traditionally styled hinges. These create a stylish entrance to your log cabin. 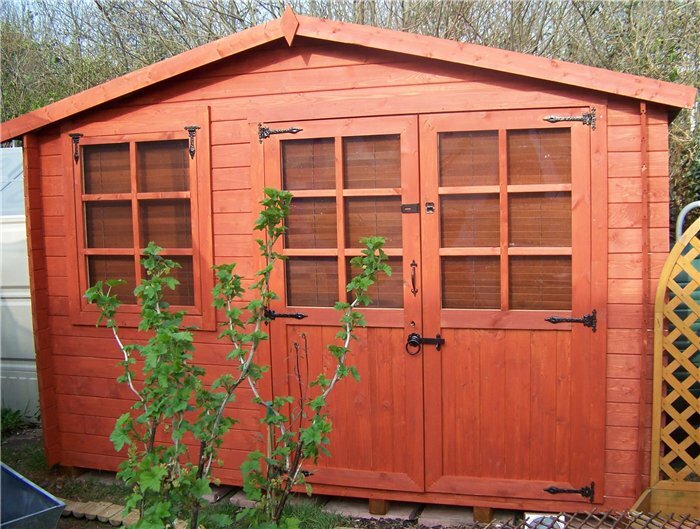 The half wooden panel and locking system ensure that this building can be securely locked for your peace of mind. The double doors are very convenient for a multitude of uses. Carrying large garden furniture and lawnmowers in and out will be a cinch, even for two of you to pass through at once. And if you're planning on using your Clubman as a summer house, leaving the doors open in the summer will give you plenty of light and fresh air. The two top-opening windows also help to provide the log cabin with plenty of natural light. This creates a bright and airy interior that's pleasant and enjoyable to use. They're also ideal for letting in the breeze on a warm summer's day. The windows are styled with Georgian bars, complemented by traditionally-designed hinges. 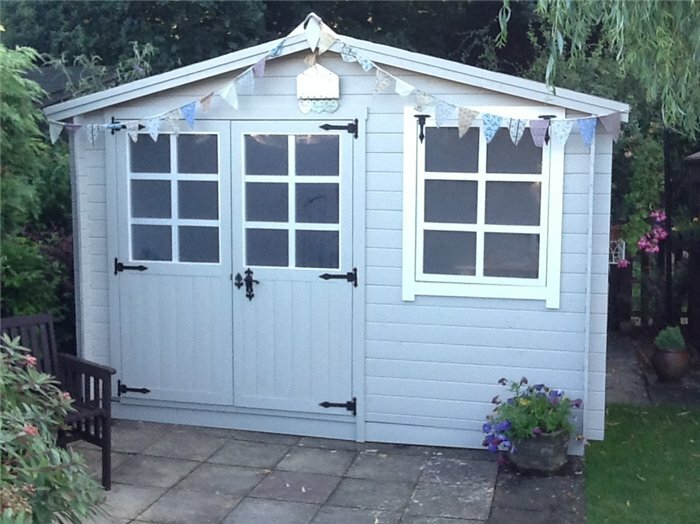 This gives a classic, traditional appearance that would look fantastic in any garden. 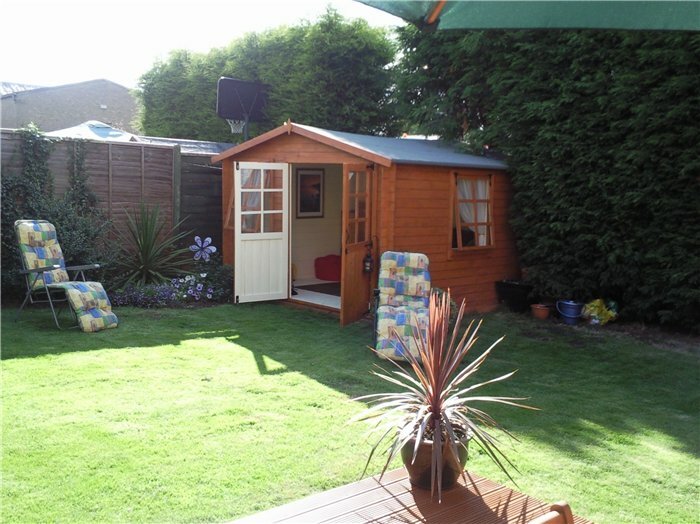 The Clubman Log Cabin has been designed with our standard 11mm tongue and groove floor. These engineered boards slot together, creating a solid and stable floor that is smooth to the touch. This is a great flooring option and ideal for lighter intensity uses like summer houses and other living spaces with light furniture. The flooring has also been included in the price of this building. Tongue and groove roof boards: The roof panels for the Clubman are constructed from quality tongue and groove timber, just like the rest of the log cabin. This helps to increase the weather resistance of the building as well as its overall longevity, ensuring that it's built to last. The roof purlins add extra support to the roof, making it suitable for different grades of roofing felt for added protection from the elements..
Due to its position on the building, the roof is the most exposed and vulnerable to the weather, so it needs protecting as a result. 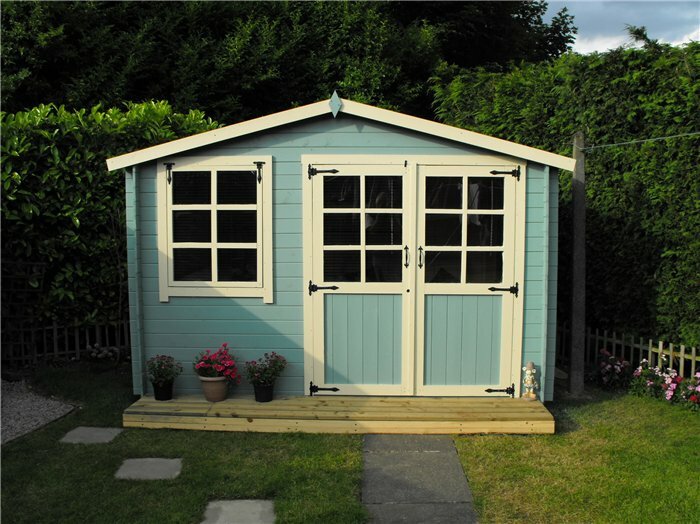 We have included our mineral felt weather protection with this building, which is a higher grade than our other felts and is also used on our premium shed ranges. Effective Simple and easy to install to your building, It is cost-effective solution.The mineral felt gives the cabin a greater level of defence against the weather, than other methods. Width 345.4cm 11'4" 345.4cm 11'4" 345.4cm 11'4" 345.4cm 11'4"
Depth 263.2cm 8'8" 319.8cm 10'6" 265cm 8'8" 321.6cm 10'7"
Eaves Height (Inc Floor) 180.9cm 5'11" 180.9cm 5'11" 180.9cm 5'11" 180.9cm 5'11"
Ridge Height (Inc Floor) 226.8cm 7'5" 226.8cm 7'5" 226.8cm 7'5" 226.8cm 7'5"
Width (Internal) 302.2cm 9'11" 302.2cm 9'11" 302.2cm 9'11" 302.2cm 9'11"
Depth (Internal) 238.6cm 7'10" 295.2cm 9'8" 238.6cm 7'10" 295.2cm 9'8"
Front Roof Overhang 10.4cm 4" 10.4cm 4" 10.4cm 4" 10.4cm 4"